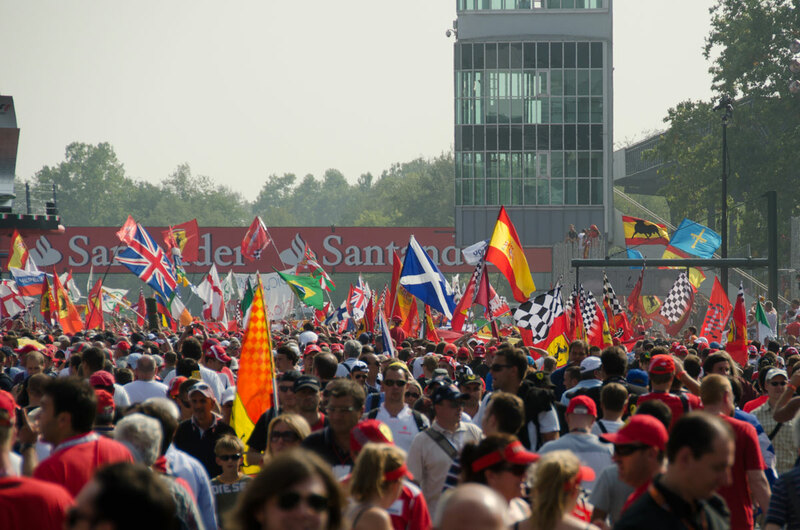 AUTODROMO NAZIONALE MONZA SIAS SpA, is located in a royal park in the town of Monza, about 30km northeast of Milan. It’s proximity to Milan means that unless you need to be at the track super early to bag yourself a good spot, you can quite happily base yourself in the city for the weekend and commute to and from the circuit each day. There are 3 international airports that serve as entry points for Milan, Malpensa (40km), Linate (7km) and Bergamo (45km). From each airport a number of options such as bus, taxi and airport shuttle and train exist to get to you into central Milan, usually dropping visitors off at the main train station. See below for information on driving directly to Monza. 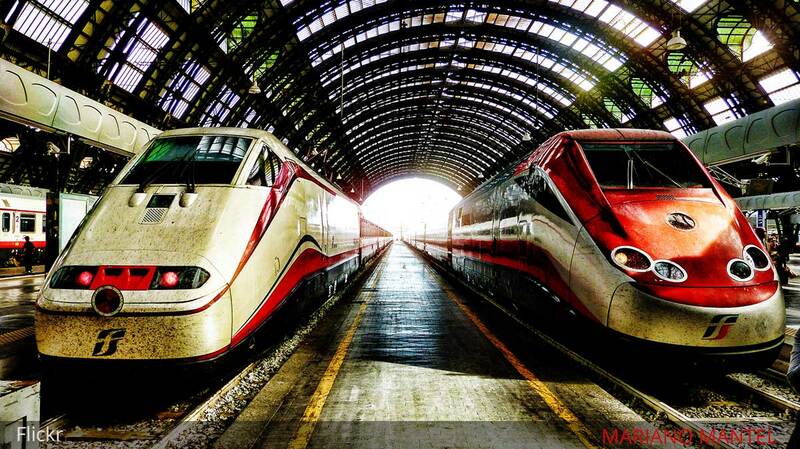 From other cities in Italy and destinations in central Europe you might find that arriving in Milan by rail is preferable to flying, cutting out the need for an extra journey into the city centre and making the next stage of getting to the circuit all the more convenient. Architecturally awe-inspiring, the city’s main station, Milano Centrale also happens to be one of Milan’s most impressive attractions and well worth taking some time to see. Public transport in Milan is all operated by one central authority (ATM) so the same tickets can be used on buses, in the metro, trams etc. Purchase tickets from convenience stores, news stands and machines inside metro stations. It’s important to validate your ticket when entering a bus or tram (street car) using one of the yellow or orange machines found on at the station for the metro and onboard buses and trams. Do this each time you change vehicles and you’re good for up to 90 minutes of travel. A single journey ticket costs €1.50 but a book of ten can be purchased for €13.80. Alternatively pick up a 24 hour (€4.50) or 48 (€8.50) hour pass. In Milan, you’ll be able to get most places you want to go on the metro. It’s very easy to navigate the 5 color coded lines and 103 stations. The metro opens at 6AM and closes at midnight (2AM on Saturday night). 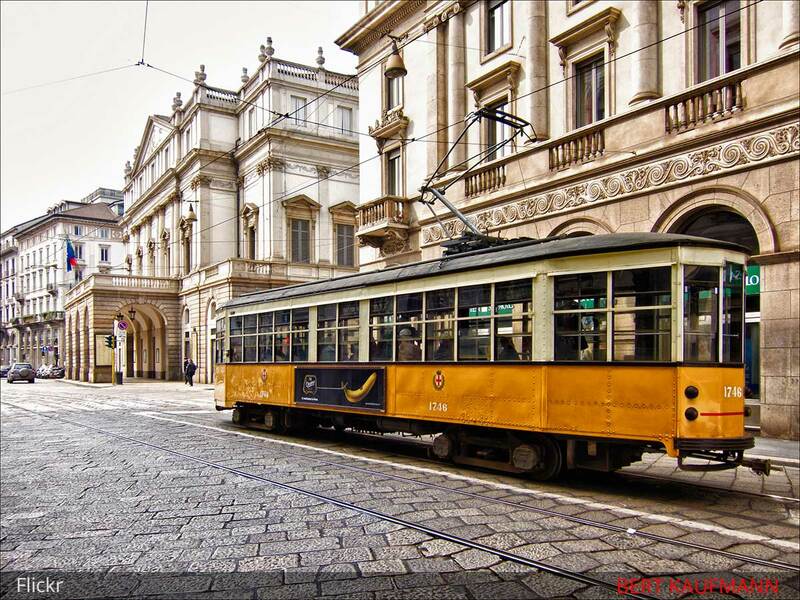 A tourist attraction in it’s own right, Milan’s iconic trams are not only charming but also an efficient and easy way to get around. Some of the yellow and orange trams have been in service since the pre-war years and have changed very little. Information on tram routes and schedules can be found at tram stops and the time of the next tram is displayed on a live display. There are two train stations in Monza that you might use over the course of the weekend. The closest station to the gates of the circuit is the tiny Biassono/Lesmo station to the north east of the circuit, about a 10 minute walk from the royal park that houses the Monza Audodrome. Regualar suburban train lines S8, S9 and S11 cover the trip from Milan to Monza in about 20 minutes and run every half an hour to ‘Monza’ station in the town centre, about 6.6 km from the track. From here there are a number of ways to continue to the park which are listed below, but be aware that however you proceed, you’ll still face a 15 minute walk from the gates of the park to the circuit itself. The station is about a 40 minute walk to the gates of the circuit so not particularly recommended given you’ll more than likely face another longish walk to reach your grandstand in what is one of the largest parks in Europe. Over the Grand Prix weekend (but not on Thursday) F1 fans can use a free shuttle service between Monza and the circuit gates. Just exit the station and the bus is there. The shuttle is usually jam packed and standing only – not the most comfortable of rides but it’s only about 20 minutes. For a more comfortable alternative to the free shuttle bus there are two regular buses that connects Monza Station to the circuit. Bus 204 drops fans off at Verdano Gate and Bus 221 stops at Verdano and Porta S. Maria delle Selve Gates. Both services leave from Corsa Milano near the station and are oppertated by Northeast Transportation and Brianza Transportation respectively. The other alternative if you’ve planned your arrival right is to just continue on one of the regular trains that runs to Biassono/Lesmo. Grand Prix or no Grand Prix, there are regular buses connecting Milan and Monza operated by ATM. Bus lines 723, 724, 722. Milan’s easily identifiable white taxis can be a pricey way to get around and not usually necessary. If you do need a ride go to the nearest taxi rank as trying to hail one in the street is almost always futile. For most trips a meter is used but on certain routes like to and from Milan’s airports a fixed rate price applies. You may wish to take your own car or a hire car to Monza and numerous rental companies like Hertz and Europcar have depots at all of Milan’s airports. Times for driving to the circuit under normal conditions are provided below but allow up to an hour of extra time during a Grand Prix weekend. To get from Milan to the circuit head northeast along the Viale Fulvio Testi and continue onto the SS36. Exit to Monza/Saronno and merge onto Viale Lombardia. At the roundabout take the 3rd exit onto Viale Cesare Battisti. After 1.5 km turn left onto the Viale Regina Margherita and continue onto Viale Brianza. From here follow local signs to parking areas. 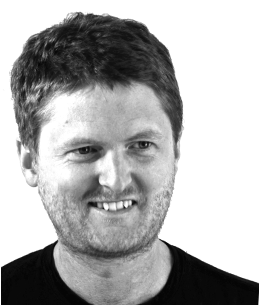 Annoyingly there is no parking at the circuit itself so anyone driving to the Grand Prix will need to use a park and ride service for the final part of the trip.